Four Israelis might have refuted Noam Chomsky's theory of "innate grammar". Linguistics geeks read on. What does your child aspire to be? Wolfish Musings posts about a disconcerting encounter with his son's yeshiva principal. Wolf's son loves animals and so far aspires to be zoologist. In short, he is a child with normal interests and aspirations. It goes without saying that if the first paragraph had described Wolf's son as loving learning and aspiring to be a Rosh Yeshiva then he would also have normal interests and aspirations (okay, I lied--it didn't go without saying or else I wouldn't have said it). But the point is that there are other normal goals for children besides being a Rosh Yeshiva! Allowing that the principal wasn't trying to make any kind of radical statement, and certainly taking into account that Wolf writes that he is a fine person, worthy of respect, one who seeks to build children up etc.--still, this is almost the kind of stale thinking that Eliezer Berkovitz deplored, particularly in his history of Halakhah, Lo Bashamayim Hi: The Nature and Function of Halakhah. He points out that in a real society there simply must--must!--be doctors as well as sanitation workers as well as scholars as well as even artists and poets--and zoologists too. The Torah envisions us as having a real society. Sadly, too many in communal leadership positions don't get that. I have never entered the world of manuscripts (Biblical, rabbinic etc) for several reasons: lack of access, training, time--but not for lack of interest. But I recently came across something interesting that I had to share. Mishna Avos 5:32 is a good example of a 'famous' Mishna, one that quotes Ben Bag Bag saying that one should investigate Torah from every perspective, hafokh ba ve-hapekh bah. 1) The most common one, found in most manuscripts and printed edition, the one usually cited is: de-kolah bah, "because everything is in it". 2) A second version found in manuscripts is de-kolah bah ve-kolakh bah, "because everything is in it, and all of you is in it." 3) A third, more rare version is de-kolah bakh ve-kolakh bah, "because all of it is in you, and all of you is in it." As you can see, these are quite different. Why did Ben Bag Bag say "hafokh ba ve-hapekh bah"? I don't know exactly, but there are at least two possibilities besides that which we normally ascribe to him. Steven I. Weiss interviews R. Nosson Kamenetzky about the newly published edition of The Making of a Godol. R. Kamenetzky calls those that instigated the ban "yinglakh". R. Elyashiv is "non-English-reading Rabbi Elyashiv". Great line: "I am gratified that people in the Modern Orthodox world have become my fans". LOL! There is a whole infamous chapter of Jewish history surrounding the Kol Nidrei prayer with which Yom Kippur begins. To begin with, have a look at what link this is to. That already says plenty. The Kol Nidre has been one of the means used by Jewish apostates and by enemies of the Jews to cast suspicion on the trustworthiness of an oath taken by a Jew. This charge was leveled so much that many non-Jewish legislators considered it necessary to have a special form of oath administered to Jews ("Jew's oath"), and many judges refused to allow them to take a supplementary oath, basing their objections chiefly on this prayer. As early as 1240 Jehiel of Paris was obliged to defend the "Kol Nidre" against these charges. It can not be denied that, according to the usual wording of the formula, someome might think that it offers a means of escape from the obligations and promises which he had assumed and made in regard to others. In fact, its possible that individual Jews throughout the ages themselves interpreted Kol Nidre in this way. It's no great shock that people are capable of being moreh heter le-atzmo all kinds of misdeeds. However, the prayer has a history, one view is that it traces back to instances of forced apostacy by the Visigoths among Iberian Jews in the 7th century. The prayer was written for them (or by them?) as a recitation of contrition on Yom Kippur, a renunciation of declarations in allegiance to other gods that they were forced to make. To be fair, there are not a few Jewish sources that were opposed to the prayer since it could so easily be misinterpreted. And it was. Pgs. 730-731 of the Hertz Chumash has an impassioned defense of Kol Nidre as well as a plea for to retain it. This was certainly an issue, even among Orthodox Jews in the West in the 1930s, when the Hertz Chumash first appeared. There was one instance where Rabbi Hirsch did omit a traditional prayer. In 1839, Rabbi Hirsch deleted the recitation of Kol Nidrei in Oldenberg....Rabbi Hirsch explained it in writing to the correspondent of the liberal Allgemeine Zeitung des Judentums: "Although last year the Kol Nidrei was deleted for halachic reasons, neverthless I came to the conclusion that this change, although halachically grounded, would better not be instituted by an individual rabbi. Therefore I requested that the congregation recite it, but only once, not three times." In any event, he reinstated Kol Nidrei the following year. An interesting cultural artifact is the centrality of the Kol Nidrei in the alleged first talking picture, Al Jolson's The Jazz Singer from 1927. To me, that seems to indicate a refreshing lack of prejudice against Jews in the United States, this despite the more benign country club variety antisemitism that was quite prevalent. Surely it would have been unthinkable for such a film to be produced overseas at that time. More importantly, today many Jews are completely unaware that there ever was a controversy. While it says something about their own Jewish education, it also says something about the society in which we now live (David Duke notwithstanding). It boils down to this: 'How long will you keep shifting from one opinion to the other?' Or at least that's my summary of Hillel Halkin's interesting review of the Etz Hayim Torah and Commentary in Commentary. It's long so I decided to split this into two posts, but its worth reading. I finally read the infamous Prolegomena to the History of Ancient Israel by Julius Wellhausen. I bet not more than a thousand people have actually read the book itself in the past fifty years. *It was exactly as wordy in that 19th century Germanic way that I expected. *It was far less boring and technical then I expected. *Wellhausen is as antisemitic as expected, but it doesn't overwhelm the work. *It is competely true that many of his observations were well noted by classical Jewish sources. *It is no mere apologetic to point out that a great deal of the contradictions, anachronisms and doublets which he noted were also noted by Chazal and our commentators (as well as the nature of Elokim and YHVH). *However, much the way in which R. Aharon Feldman noted that the world really does appear to be billions of years old, by looking at the stars, Wellhausen's notes these problems (and others) and they need not be inherently antisemitic. If they were obvious to Chazal, why shouldn't they be obvious to Wellhausen--and more importantly, not based on dishonest reading? *He indeed conjectures many things for which he has no basis conjecturing. *His views kohanim as nothing but papal priests, which I needn't point out is an anachronism. It is true that other respected methods of Bible scholarship are pursued today, including the literary method that treats it as a seamless document for the purpose of literary analysis (e.g., Robert Alter), and many of Wellhausen's assumptions have long been proved false, and neither a J nor an E nor a P nor a D has yet been found, but the documentary hypothesis did not wither and die and not every problem has been given a solution. Some well-meaning Orthodox defenders of the faith delight in repeating the canard that through the heroic efforts of Rabbis David Hoffman and Hayyim Heller, the death knell was sounded for the documentary hypothesis decades ago--and it need no longer be taken seriously. Nothing could be further from the truth. Since Wellhausen's documentary hypothesis isn't dead and has not been definitively rebutted, despite what we might wish, I plan to post more about it*; on problems with it and problems without it. After all, I didn't plow through the Prolegomena because it was fun, believe me. This begins a series of posts which I hope to make consisting mainly of primary source descriptions of Yeshivoth throughout the ages. This first one is a description of the Geonic yeshiva of Sura at Baghdad, from the late 10th century, by a R. Nathan ha-Bavli. R. Nathan was present during one of the two kallah months during which people would travel to the yeshivoth for intensive learning. Can you think of 1200 names? Came across an interesting article by Jeffrey Tigay in Bible Review (Feb. 2004) called "What's In A Name?". The article discusses the instances of theophoric names* among the ancient Benei Yisrael. The purpose of the article was to draw conclusions about the instances of idolatry among the Israelites in the Biblical period by studying the names. For example, inferences are made about personal names that include "baal", although Tigay acknowledges that these are not necessarily intended to invoke the Canaanite deity of that name. What I find interesting is a bit of trivia; the sheer volume of available names he studied. There are, he says, 521 individual theophoric names in Tanakh. He also studied more than 700 names found in ancient inscriptions, but not in Tanakh. I had no idea there were so many names from inscriptions. In short, over 1200 names, which I'd love to have a list of. Anyway, more than half of these 1200 names, 671 contained a theophoric element. *personal names that include the name of a god, e.g., Shmuel or Eliyahu or Yechezkel etc. Menachem Butler mentions Artscroll's R. Nosson Scherman's talk at YU's beis midrash. He spoke at the opening of the YU Museum exhibit on the Talmud, and contributed an essay to the catalog. Hearing him correct himself- "Shabbos" became "Shabbat"- to a largely non-Orthodox audience was interesting. A black hat is a Jewish ritual item. I feel like I should say something about group identity blah blah blah or rabbinical garb blah blah blah, or the Mishna Berura. I remember getting one (two, actually) before my bar mitzvah. It was definitely considered a rite of passage, and probably was for a generation or two before me. The hat separates the men from the 12 year olds. Have you got one? Do you wear one? When? Why? Why did you? Why don't you? Why do you sometimes? Imagine that for some reason someone has enough money to publish a Talmud without any commentaries whatsoever, just the text.Yes, it isn't practical. Yes, only five people would even want to buy it, but imagine anyway that it was printed and distributed. What would the reaction to a Gemara like that be, if you can imagine that it gets detected on the radar screens? Jameel at the the Muqata has a very interesting post about a visit he took with his family on sukkos to some Samaritans who were kind enough to invite them into their home. Jameel says it smelled amazing, with all those fruit on the ceiling, including many esrogim. All I could think when I saw the picture is that I bet they don't pay what I do for an esrog! DovBear posts on ketav ivri. The story in his post makes his "Mood: Pessimistic", but I'm just happy that one of my geeky loves is being discussed. There's an amazing story about Shaul Lieberman, which made his reputation. He took a really corrupt and incomprehensible section of the Jerusalem Talmud and reconstructed it by suggesting some 30 radical changes (e.g. the opinions of authorities X and Y are reversed, this word "not" should be deleted, the phrase Z should be inserted here, section 3 should precede section 1 etc.). All the difficulties were resolved, and it made perfect sense and had continuity with what came before and after. It was a tour-de-force and widely admired, but considered extremely speculative. Many years later, an old manuscript was discovered which had all 30 of his changes. For all I know this is true. For all I know. But it certainly seems like this is a wildly exaggerated version of what might have occurred, if it did at all. I mean, thirty changes? Its striking because this is exactly parallel to the type of "feats of the mind" gedolim stories routinely traded and recounted in the oilam ha-yeshiva. When a patah is under a het that ends a word, it becomes "ach" rather than "cha". Classic examples: mashiach, tzemach etc. but not "mashichah" or "tzemachah". Something that fascinates me is the errors in very old books, works that were meticulously and scrupulously researched. Why the errors? Simply because the available facts were limited. Here we see a chart that shows the ancient Hebrew alphabet from R. Azariah de' Rossi's 16th century opus Me'or Enayim. When the Ramban was 'oleh he discovered that to truly understand much of Tanakh requires actually being in the land of Israel. Some of his prior held views, mainly relating to geography, were debunked simply by his being able to actually see and experience what until then were only words. Another interesting consequence of his move to Eretz Yisrael was his revised understanding of the shiur of the Biblical shekel ha-kodesh. There was an ancient shekel possessed by Jews in Acco, with ancient Hebrew writing on it. With the help of Samaritans, he was told that the writing confirmed that it was indeed a shekel. After weighing it, the Ramban concluded that Rashi's view of the shekel's weight (in Shemos 21:32) was correct, while his own view (in Shemos 30:13) was inccorect. Analysis of a Google map led to the discovery of a Roman villa like this one in Parma, Italy. "Using satellite images from Google Maps and Google Earth, an Italian computer programmer has stumbled upon the remains of an ancient villa. Luca Mori was studying maps of the region around his town of Sorbolo, near Parma, when he noticed a prominent, oval, shaded form more than 500 metres long. It was the meander of an ancient river, visible because former watercourses absorb different amounts of moisture from the air than their surroundings do." edit: I tip my black hat to Mis-nagid. In July I began a series of posts on the Rambam's principles of faith, 13 in all. It kind of petered out after just 5 of them (refresh your memory: I, II, III, IV and V.). I intend to resume and continue. Stay tuned. 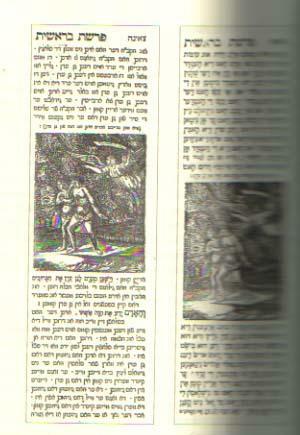 In this mid-19th century Romm edition of the Tzenarena Adam and Eve are dressed in fig leafs and hands. How could the venerable Romm printing press, creator of the inspired Vilna Shas print an illustration of Chava with her pupik visible? It's disillusioning, really. As they say, you can't ask a kasha on a ma'aseh. I remind myself, I had an encounter quite a number of years ago with a representative of the so-called Hokhmat Yisrael [Wissenschaft des Judentums]. He was a very outstanding scholar. (At this point, a footnote tells us that "the scholar whom the Rav was referring to was Professor Saul Lieberman (1898-1983) of the Jewish Theological Seminary of America. The Rav and Professor Lieberman, who were related by marriage, met at a brit milah. Professor Lieberman was married to Judith Berlin, the granddaughter of the Netziv.") He told me that lately they had discovered a parchment, a megillah, in which it was stated unequivocally that a kohen is enjoined from defiling himself with a sheretz*. So I said to him: "Do you take it seriously?" "Of course," he answered, "very seriously." You know, they [the devotees of Hokhmat Yisrael] have the answer right away. It is a different kabbalah, a different tradition. They operate with "traditions" in the plural. So I mentioned a name to him. The name was known to him, and I knew that he did not like the person. I asked him: "Do you know him?" "Is he a scholar?" I asked. "No, he is a boor and an am ha-aretz mide-oraita," he answered. I said to him: "So only we have a monopoly on boors and amei ha-aretz mideo-oraita? Fifteen hundred years ago there were also boors and amei ha-aretz. Since there was no paper, the boor had to write on parchment. So you found a nice hiddushei Torah, so what!" *The halakhah is that a kohen is permitted to have contact with a sheretz. Paranthetically, I wish I knew more about Prof. Lieberman. Of those who know, is it fair to say that if he'd chosen to become a rebbe in a traditional yeshiva environment (if I am not mistaken, he considered teaching at Chaim Berlin) that ultimately he'd have been considered in the yeshiva world another one of those idiosyncratic rabbis like R. Chaim Heller (he of the Peshitta obsession)? Or is that impossible? I've read his classic "...In Jewish Palestine" books. Putting aside politics and everyting, 117,000 people learning Torah is phenomenal. But these numbers--how is this possible? In a society with more children than adults there are more married men learning full-time then kids or unmarried Beis Midrash bochurim? Ammiel Hirsch, is of course, co-author of One People, Two Worlds with Yosef Reinman. Regarding Marc Shapiro (R. Jacob Jehiel Weinberg biography, the Limits of Orthodox Theology, many papers etc) I thoroughly enjoyed his books, but am I the only one who gets the impression that he can't figure out why no one will ban his books? Time and again I've noticed that when I read something that I know a lot about I'll inevitably catch a factual error (especially if the thing I'm reading wasn't written by a specialist in that subject). This shouldn't be surprising. After all no one's perfect. If a treatment of some subject gets 98% right that's really good. But if this is true of what I do know, what about what I didn't know? Surely everything contains factual errors. "....a powerful figure: Elijah ben Solomon Zalman (1720-97), head (gaon) of the Academy of Vilna." I'm not sure its an exaggeration to say that any twelve year old kid in yeshiva knows that this is nonsense. The Vilna Gaon most certainly was not the head of the Academy of Vilna (nor was there an 'Academy of Vilna'). Now I'm not saying this is an unreasonable screw-up. Armstrong probably read a hundred and one times over the years that a gaon was an academy head. She probably didn't even realize that she was making the Vilna Gaon a rosh yeshiva without having read it in any source. But a mistake it is, and not a minor one in that to understand the Vilna Gaon is to know first of all that he was an independent, secluded scholar. Even his having disciples meant something completely different than having disciples normally does. It's understandable how Armstrong got this wrong, but of course it means that she probably has no concept of the Vilna Gaon apart from some dry facts, namely that he was reputedly a genius, extremely influential and an opposer of Chassidus. So what else does she misunderstand and what else does she get wrong, especially in the parts of the book that deal with Christianity and Islam, which I have less intimate knowledge of? This is a problem native to any work of this kind, al achas kamma ve-kamma, articles in the daily newspapers or popular magazine. Its pretty obvious that one can cherry-pick through a vast corpus like the Talmud and rabbinic literature to find nearly any opinion, or something that resembles it. Yes, I do it sometimes too--but I'm not sure the response to this unfortunate phenomenon is to arm yet more people with more talking points, more "famous" Talmudic sayings they can use to support any position, political or otherwise. (For some reason I'm reminded of "Tzedek tzedek tirdof" (Deut. 16:20), from last week's sidra, which happens to have thirteen words in that verse, not three; you can look it up). And what the heck is a "verse of Talmud"? R.L. Burnside died a few days ago. He was 78. In DovBear's Orthodox Acid Test many suggestions are made to define the question that could determine if one is an Orthodox Jew. This invariably led to the observation that the boundaries between Orthdoox and Conservative are sometimes imprecise at the left-wing and right-wing edges respectively. I offered up that some such Jews say that the only real dividing line is mixed tefillah. There's a very clear line. It's Rosh Hashanah, you don't have a shofar, and the only shul in town is three miles away and a member of the United Synagogue of Conservative Judaism and doesn't have a mechitza. If you walk to shul to hear the shofar, you're Conservative. If you stay at home, you're Orthodox. I love history. One of the things that fascinates me about history is the way it is layered. Imagine if you photographed the view outside your front door every minute for an entire day. With nearly 1500 photographs, some would look exactly the same, but if you lay them out next to each other you'd see the changes in the view from your front door. In this frame there is a man that wasn't there, in that frame its late afternoon etc. That's like a tiny microcosm of the layers of history. What also fascinates me is the layers that develop in things like language, in this case, Hebrew as spoken in the lands of Ashkenaz. Ashkenazic Hebrew gets no respect. It was rejected by early Reformers, maskilim and Zionists as a ghetto pronunciation(s), a Eurofied shprache that removed the Semitic character of Hebrew (and by extension, Aramaic pronunciation). I'm not going to comment on that, but I find the layers in Hebrew Ashkenaz to be worth noting. For starters, there is a great deal of evidence that Hebrew was voiced in Ashkenaz much like that of the Sephardim until the 14th century. For example, they did not distinguish between kamatz and patah or tzere and segol (albeit in the opposite way that the modern Chassidic pronunciation doesn't make the distinction). This is attested to by Ashkenazi grammarians, like Yekusiel of Prague, as well as the massive confounding of those nekudos in many pointed manuscripts from Ashkenaz. An interesting historical point was how the pronunciation of the letter ח (hes, spelled חית) came to be pronounced in Ashkenaz. By midieval times it had lost its Semitic character, but in the two great Ashkenazic communities it came to be pronounced differently. In the one, that of the Rhineland in the West (called at the time Shu"m, after Speyers, Worms and Mayence), the sound had migrated toward that of H. In the other community, that of Rothenberg, Nuremberg and Prague, it had come to be pronounced with the familiar Asheknazi way, like the "ch" in "Bach". As a result, the Eastern Ashkenazim made fun of their Western brethren, calling them בני הית (Benei Hes). The Westerners countered by referring to the Easterners as בני כית (Benei Khes) as if to say, "Hey buddies, a ח isn't a ה, granted, but it ain't a כ either." This was, of course, a sly reference to the Children of Heth, in Gen. 23. Midieval humor; gotta love it. It should be noted that there is sometimes a difference between the formal and popular pronunciations, and sometimes this difference preserves something interesting, a residue of an earlier Ashkenazic pronunciation. When reading the Torah (formal) people will usually read carefully and literally according to the vowels but modify them informally, as in when studying Torah. An example of this is how the word דם "dam" (blood) is pronounced. It is written with a kamatz and should logically be read as "dum" (or "dawm")--and when reading the Torah it invariably will be, as it will when the list of plagues at the seder is recited. But popularly it will invariably be pronounced as "dam", as if there is a patah. That's a left-over from long ago. Another example is Jerusalem; formally pronounced as Yerusholoyim but popularly almost always as Yerushalayim. A well known example of a residue is the name "Yankev" for Ya'akov, which preserves a remnant of the Semitic pronunciation of the consonant ע, long lost among Ashkenazim. An interesting example is how the fourth letter of the Aleph-Bet, the ד (daled) is pronounced. As a child I could not figure out why it was spelled דלת (dales) yet pronounced daled. It is, of course, the remnant of the earlier dalet, only it migrated toward daled instead of dales (although the 18th century Bibliophilus dictionary has dales). Finally, a note about the changed shuruq/ kibutz (u, oo) toward "i", present today among Chassidim mainly. As early as the 16th century this was remarked on, by the Maharal among others. Some defended it, as it originally preserved a distinction between the shuruq and the shorter kibutz, others were appalled by it as a corruption. Be that as it may, its interesting that in some cases, even among those who pronounced it as "i" they made one exception: for the word רוח (ruach, riach). In Yiddish, "riach" is a curse word, as in a riach in zayn tatn, "Damn his father." When the Torah was read רוח would be pronounced "ruach", which is evidence of a self-awareness that is probably since lost. In the main, most of this info is from The Phonology of Ashkenaz by Dovid Katz. It says in Yoma 71b, regarding Hillel: He saw a skull floating on the surface of the water. He said to it: "For drowning others you were drowned; and in the end they that drowned you will be drowned." That's a famous obscure Gemara. Hillel, may he rest in peace, saw Pharaoh's skull floating on the water. It was Pharaoh who used to take one hundred and fifty young children of Israel very morning, and another hundred and fifty every evening and cast them into the sea. That is why the Lord slew him and drowned him. And the ancients tell us that the Hillel referred to in the Mishna is really Moses our master, may he rest in peace....And he said to the skull, "Because you slew human beings and threw them into the water, the Lord has slain you and cast you into the water"....The is the hidden [mystical] meaning of this statement. Far be it for me to judge whether the Rambam would have liked this peshat, but suffice it to say that it is of the sort that is entirely different from the rationalist approach of the Rambam, that's for sure. [James Henry] Breasted, when asked by a student, How does one become an Egyptologist? replied, "First, he must marry a rich woman." Solve an ancient abecedary mystery! We live in a strange world, don't we? As expected, there are strange things that really defy explanation. 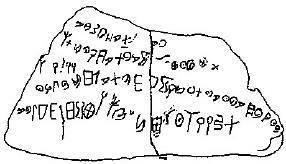 In 1976 an excavation of an ancient Israelite village uncovered written on a piece of pottery what is now called the 'Izbet Sartah abecedary (an abecedary is a list of the alphabet in order). The inscription was dated to 1200-1000 BCE and it looks like the above image. Actually, only the bottom line is the abecedary. What is unusual about this (aside from its existence in and of itself!) is that it is written from left-to-right (that's an 'aleph all the way to the left, and the crossy looking thing at the right is the tav). That itself isn't so unusual in ancient writing. The ancient Greeks sometimes wrote using boustrophedon, which means that the text alternates in direction depending on the line. and then reverse on the next line, etc. Of course that was how the early Greeks did it, but this is the only example of such Israelite writing. Interestingly, the first four peraqim of Eicha are acrostics; each verse or group of verses begins with a letter of the aleph-bet and the chapter is 22 verses long. The second through fourths pereqs actually reverse the פ and the ע for no apparent reason (while the first doesn't). Perhaps taken with the 'Izbet Sartah abecedary we can postulate that the order of the alphabet simply wasn't fully stable until a later date. Of course that's not a very complete answer. Another puzzle is that the first four lines above the abecedary are gibberish, or at least it seems like it thus far. Some have said that it may be a student's practice, the ordering may be simple error. But of course there's no evidence for that. Wanna solve an ancient mystery that has experts baffled? What's the deal? The August 22 New Yorker had a very interesting article on Billy and Franklin Graham and American Protestantism. It quotes an apparently famous sermon called 'Shall the Fundamentalists Win?' given by Harry Emerson Fosdick on May 21, 1922 at the First Presbytarian Church on W. 12th street in New York City. Fosdick was "a Baptist minister raised in the old orthodoxy" who "found his faith transformed by a study of the orthodoxy's hindrance to the progress of mankind". have assimilated as part of the divine revelation the exhilarating insight which these recent generations have given to us, that development is God’s way of working out his will. They see that the most desirable elements in human life have come through the method of development. Man’s music has developed from the rhythmic noise of beaten sticks until we have in melody and harmony possibilities once undreamed. Man’s painting has developed from the crude outlines of the cavemen until in line and color we have achieved unforeseen results and possess latent beauties yet unfolded. Man’s architecture has developed from the crude huts of primitive men until our cathedrals and business buildings reveal alike an incalculable advance and an unimaginable future. Development does seem to be the way in which God works. There is much to pick apart, to be sure. 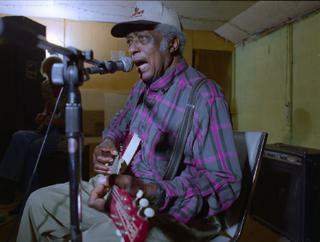 Ancient forms of music still extant, such as Indian sitar music is hardly primitive. There is much to be commended from the past as well as in the present and future. But Fosdick worded a good point well. Professors on the Parashah: Studies on the Weekly Torah Reading by Leib Moscovitz is due in October. I can't tell if they're trying to be cute or provocative with the title, but its kind of both. Lemaasah, you'd know what the book was even if they only called (or should I say spelled) it "parashah".